This prabandham (collection of hymns) is the third among the four prabandhams composed by SrI nammAzhwAr, who is the leader among the AzhwArs who have been granted unblemished knowledge and devotion by emperumAn, and who is the leader among those who have surrendered to emperumAn. 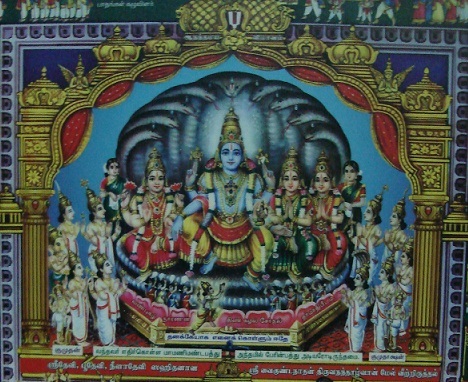 thiruviruththam, thiruvAsiriyam, periya thiruvandhAdhi and thiruvAimozhi are the four divine compositions of nammAzhwAr. These four prabandhams are the essence of the four vEdhas. This prabandham is the essence of atharvaNa vEdham and is the 7th prabandham in the third thousand, called as iyaRpA, among the four thousand hymns composed by all the AzhwArs. periya thiruvandhAdhi means thiruvandhAdhi which is considered great. andhAdhi is a classification of poems in which the last word or line or syllable of one hymn forms the first word or line or syllable of the next hymn. When the last word of the last hymn becomes the first word of the first hymn, it is called as maNdaliththal. andhAdhi forms one of 96 types of prabandhams. There are internal classifications among andhAdhis such as padhiRRandhAdhi (andhAdhi with ten pAsurams), nURRandhAdhi (andhAdhi with hundred pAsurams). 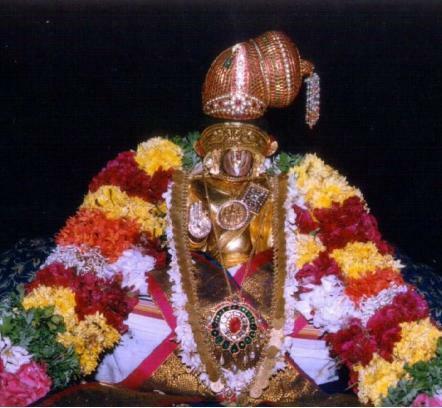 This prabandham (periya thiruvandhAdhi) is composed of 87 pAsurams, less than 100. While the andhAdhis compiled by the first three AzhwArs had 100 pAsurams each, this andhAdhi (compiled by nammAzhwAr), which is less in terms of number, is termed as periya thiruvandhAdhi. The reason for this is that the term periya (or peridhu) would refer to greatness in form [big or huge] as well as to greatness in terms of qualities. Thus if someone is referred to as periya manidhar (great person) it would be because of the greatness of his qualities only and not to hugeness in form. Since this prabandham, while being smaller than the other thiruvandhAdhi prabandhams in terms of number of pAsurams, has sweetness of words and sweetness of meanings, our pUrvAchAryas (preceptors) gave it the title of periya thiruvandhAdhi. One need not ask whether the other thiruvandhAdhis composed by the first three AzhwArs are siRiya thiruvandhAdhi (small thiruvandhAdhi). What is to be kept in mind at this juncture is that this prabandham has a greatness and not about any comparison with other thiruvandhAdhis. 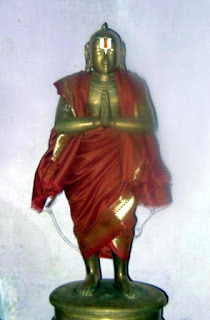 Another reason can also be attributed for naming this prabandham as periya thiruvandhAdhi. There is a pAsuram in this prabandham (pAsuram 75) in which AzhwAr tells emperumAn “puviyum iruvisumbum ninnagaththa nI en seviyin vazhi pugundhu ennuLLAy avivinRi yAn periyan nI periyai enbadhanai yAr aRivAr Un parugu nEmiyAy uLLu” (Oh emperumAn! Both materialistic and spiritualistic realms are under your control. Are you, the one who is controlling these two realms, the bigger entity or am I, holding you inside me, after receiving you through my ears, the bigger entity? You please analyse). vEdhas state that you [emperumAn] are mahathO mahIyAn (larger than the largest entities). Is this appropriate? I am bearing you inside a corner of my form. Am I not then the bigger entity, between the two of us? AzhwAr mercifully states that this has to be analysed. Thus, since AzhwAr spoke about his greatness in this prabandham, this came to be called as periya thiruvandhAdhi! The vyAkyAnam (commentary) for this prabandham has been written by periyavAchchAn piLLai. We have taken liberal assistance from puththUr swAmy’s explanatory notes on periyavAchchAn piLLai’s vyAkyAnam. Note – this section is written in English based on kAnchIpuram P B aNNangarAchAryar swamy’s dhivyArtha dhIpikai vyAkyAnam for periya thiruvandhAdhi. This entry was posted in iyaRpA, periya thiruvandhAdhi on October 4, 2018 by T N Krishnan.